Ahoy, ye sea dogs and landlubbers alike! 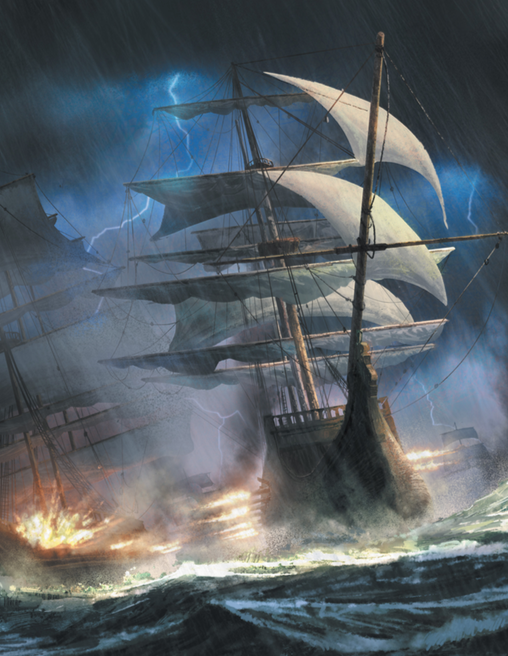 Today in honor of International Talk Like a Pirate Day we be…err… that is, we review John Wick Presents second edition of 7th Sea. The 7th Sea: Second Edition Roleplaying Game system presents a lush setting and clever mechanics for crafting a group story in the age of pirates. The game’s rich history often mirrors our own, offering enough familiarity through its mystically-infused locales that easily keep history buffs surprised. The story permeates heroism, casting the players as pirates from varying nationalities and cultural origins. Together, they can seek out fabled treasures, rescue hapless and grateful ladies or gents, play games of political intrigue with lives on the line, or just be able to tell the best story that their favored pub has ever heard. As a group and true crew, you will together attain adventure, fame, and naturally booty! First impressions can mean everything to any roleplaying game’s potential success. The first eight pages do exactly that. “A Day’s Work” is the dramatic presentation of a single gameplay session with an adventurous story and rich character that the system encourages to create. The scenes are action-packed, humor-laced, and fit together in a brilliantly crafted story that is worth reading. This is an exhilarating hook for a potential player or game master (GM) to reel in anyone to jump in without a second’s thought. It leaves your imagination thirsting for that next drop. Unfortunately the book almost lost me in the world description sections. These sections provide a sensuous and deep look at this sometimes darker fantasy twist to our own world in the lands and seas of Théah. Though a necessity to understanding the world you play in, the style of the writing here occasionally proves tedious and a little daunting. When the initial excitement of the example story begins to fade into the details, it becomes a little difficult to keep reading. A particularly high point in this construction, however, comes at the end of each Nation section with the quoted opinions of its ruler’s views on each of the other nation states. In fact, a GM starting a game for a group new to 7th Sea to only want them to learn what their nation’s views are of the other rulers lands and peoples. This will keep each player’s experience fresh with discovery or chances to reveal their own nation’s quirks to the other players. Not a necessary rule, as I know some players will naturally wish to read every line they have access to. But for the most part this will add some consistent flavor and excitement. Before you reckon my judgement harsh, know ye first that 7th Sea immediately regained my interest and excitement with the mechanics?! Aye, says I! That they do! 7th Sea is not about a GM leading a group of players through a single story, providing encounters and loot. The entire group works together to craft a cohesive story. The only way for anyone to “win” is for all to have fun. Minor victories, of course, will mark the day. Treasures will be found, lovers will be introduced, towns will prosper, and monsters will be slain! Minor defeats will keep life sporting and interesting as treasures are stolen, lovers are lost, towns falter, and new more fearsome monsters arise! This all comes into being through a true group effort. Each player will choose a background nation and the beginning morsels of their individual story. As the GM introduces the overall plot (or at least the part of it they are willing to share at this point) individual characters can start to be woven in so that by striving for the group goal that they are also writing the story of their own goals attainment. The situational ways in which the random portions of the equation come about are governed by a set of ten-sided dice and the quick-thinking of story-minded players and their GM. If you are a player or game master that has often been disappointed trying to relive their favorite fantasy novels in game systems that never adequately support them. Look no more! You may have found the next true treasure with 7th Sea. Just know, me hearties, that though the good times are there for the taking, it will cost ye all the storytelling skills you have. Together, only a true dedicated crew will prevail here. 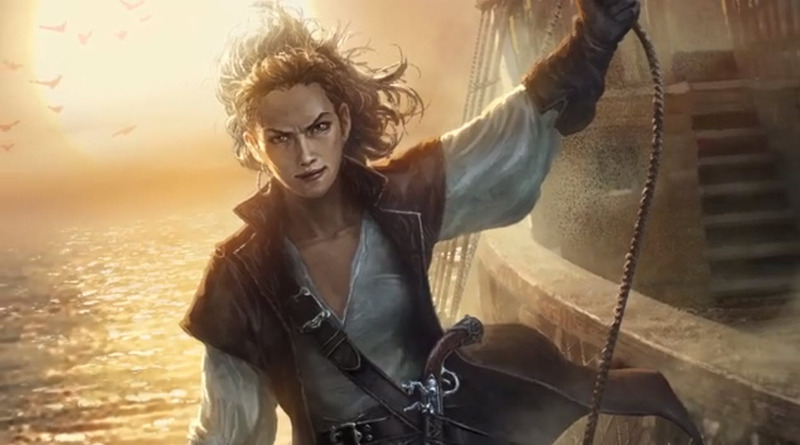 Who is your favorite pirate , real or fictional, and why? Tell us about it in the comments below! 7th Sea is available now. You can download the Free Basic Rules for the award winning 7th Sea HERE. Check with your Friendly Local Game Store, John Wick Presents, and online retailers for availability! For more information on John Wick Presents, you can visit their website by clicking their logo to the right! ← STARS AND STONES! THE DRESDEN FILES HAS ACCELERATED!